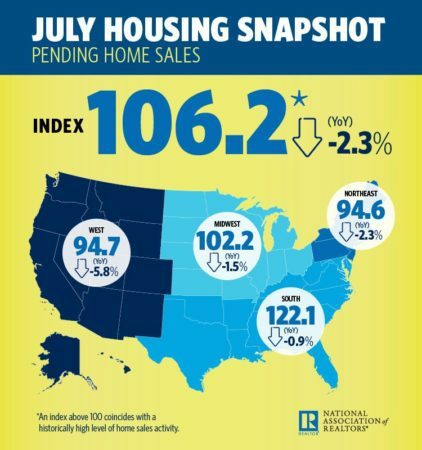 Pending home sales dropped 0.7 percent month-over-month and 2.3 percent year-over-year to 106.2 — the seventh consecutive month of annualized declines, according to the latest National Association of Realtors (NAR) Pending Home Sales Index (PHSI), released on Wednesday. PHSI tracks home sales in which a contract is signed but the sale has not yet closed. “Contract signings inched backward once again last month, as declines in the South and West weighed down on overall activity,” said NAR Chief Economist Lawrence Yun in a press release. “The reason sales are falling off last year’s pace is that multiple years of inadequate supply in markets with strong job growth have finally driven up home prices to a point where an increasing number of prospective buyers are unable to afford it,” he added. Looking forward, Yun expects existing-home sales to decrease 1.0 percent to 5.46 million, and the national median existing-home price to increase around 5.0 percent. In 2019, Yun predicts that existing sales and home prices will rise by 2 percent and 3.5 percent, respectively. “Rising inventory levels — especially if new home construction finally starts picking up — should help slow price appreciation to around two-and-four percent, which will help aspiring first-time buyers, and be good for the long-term health of the nation’s housing market,” said Yun. The PHSI in the Northeast and Midwest experienced month-over-month gains of 1.0 and 0.3 percent, but failed to make any positive headway on an annualized basis. The South and West experienced month-over-month losses of 1.7 percent and 0.9 percent, respectively, and year-over-year declines of 0.9 percent and 5.8 percent.